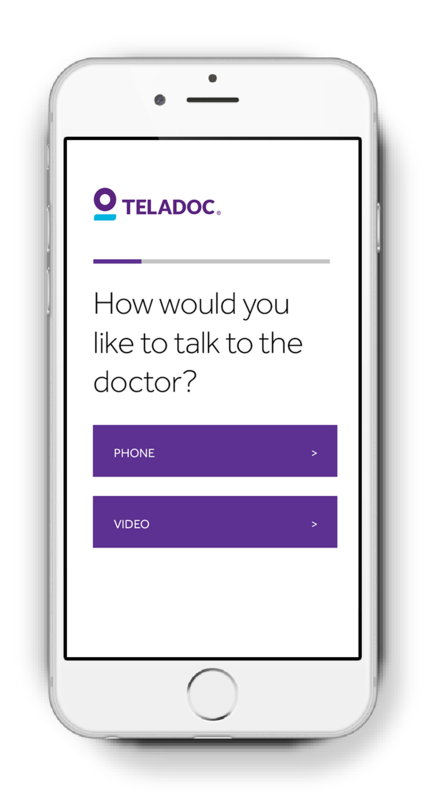 You and your colleagues have Teladoc, 24/7 access to doctors by phone or video. Get the care you need without missing work. Our U.S.-licensed doctors treat a range of non-emergency conditions. We can diagnose symptoms and even prescribe medicine when needed. We're here for you and your colleagues at work, home, or even when you're traveling—day or night. Download the app, go online, or give us a call to schedule a visit. See how Teladoc helped other companies by giving their employees convenient access to quality doctors 24/7. A company shared Teladoc with its employees through meetings and emails. As a result, almost 27% of its employees used the benefit, increasing productivity. We asked an insurance company what it thought about Teladoc. Of the colleagues that were surveyed, 100% said that they would use Teladoc again. 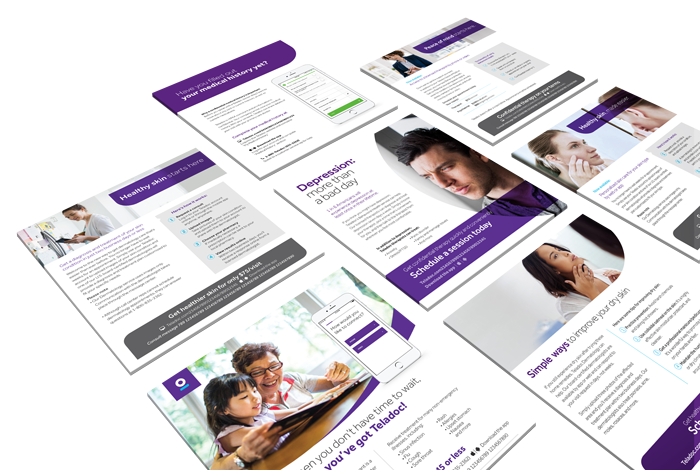 Download ready-made materials to tell your employees about their Teladoc benefit, just set up an account for access. What do my colleagues need to do after I send them the email or the link? They should set up their account using the Teladoc app or by visiting our website (Teladoc.com/my-aetna). Set up is easy and just takes a few minutes. See below for more details. What’s involved in setting up an account? To set up your account, you’ll need to provide some basic demographic information and your medical history, just like you would when visiting a new doctor. You’ll also need your Aetna ID, which is located on your Aetna member card. You should have received it in the mail, but can also access it through your Aetna account online. Your ID is 8 to 10 digits long. Examples of IDs you may see: 812345678, W123456789, or BBCCDDFA. When entering your ID, include letters and numbers. However, do not include spaces or dashes. If your ID includes a suffix like -01, do not enter. How does billing and pricing work with my Aetna insurance? Teladoc services are included in your Aetna health plan. You simply pay your copay as you would for any routine visit as part of your plan. Once you request a doctor visit with Teladoc, you will pay the appropriate fee based on your health plan, by either debit, credit, or HSA card. Can I get a prescription, and if so, what kind? Yes. Our doctors can write prescriptions when medically necessary. They can send prescriptions to your local pharmacy. Our doctors do not issue prescriptions for substances controlled by the DEA, non-therapeutic, and/or certain other drugs that may be harmful because of their potential for abuse. Also, non-therapeutic drugs such as Viagra and Cialis are not prescribed by our doctors. Teladoc does NOT handle emergency situations. We treat non-urgent medical problems. Always call 911 or go to an ER for emergency situations. You cannot be turned away because of pre-existing conditions. Who can I contact for more questions? Call 1-855-TELADOC to talk with a member service representative. Teladoc is being provided to fully-insured Aetna members and members of plans administered by Aetna. Teladoc is also provided to self-insured Aetna members and members of plans administered by Aetna whose employer has elected to offer the program to their colleagues. Teladoc and Teladoc physicians are independent contractors and are neither agents nor colleagues of Aetna or plans administered by Aetna. Teladoc is not available in all states. Teladoc does not replace the primary care physician. Teladoc does not guarantee that a prescription will be written. Teladoc operates subject to state regulation and may not be available in certain states. Teladoc does not prescribe DEA-controlled substances, non-therapeutic drugs, and certain other drugs that may be harmful because of their potential for abuse. Teladoc physicians reserve the right to deny care for potential misuse of services.